Fiction – hardcover; Harper Collins; 422 pages; 2009. Translated from the Swedish by Steven T. Murray. Review copy courtesy of the publisher. Camilla Läckberg is yet another Scandinavian crime fiction writer making it big on the international scene. The Preacher, her second to be translated into English, is set in Fjällbacka, the small Swedish fishing village where she was born. The book opens with a six-year-old boy discovering the naked body of a young woman in a local beauty spot known as the King’s Cleft. When police and forensics are called to the scene they discover the skeletons of two other women, who disappeared 20 years ago, lying underneath the body. Are these murders, committed two decades apart, linked and, if so, in what way? This is the puzzle that local detective Patrik Hedström must try to figure out. And, just to heighten the tension, he must do it before another girl, recently kidnapped from the area, turns up dead. Suspicion is immediately cast on two warring branches of the Hult family, a clan of misfits and religious fanatics descended from Ephraim Hult, a distinguished and charismatic preacher and healer. But Hedström’s investigation is not straight forward. It’s hampered by several red herrings, a long list of suspects, and a cast of hapless and incompetent colleagues from Tanumshede police station. This is a wonderfully refreshing take on the crime novel, not the least because Hedström lacks the bitterness and darkness which characterise so many other detectives in Scandinavian crime fiction. In fact, he’s a committed family man — he’s about to become a father as his girlfriend Erica is heavily pregnant during the course of the story — and much of the novel revolves around his contented, if occasionally chaotic, home life as a succession of unwanted house guests drop by to make the most of the hot Swedish summer. Unfortunately, as much as I appreciated such a domestic focus because it allowed light moments to balance out an otherwise disturbingly dark story, I found it slightly cloying and cliched in places, and, at times, clumsily written. This could easily have been solved with some judicious editing (the book, at 422 pages, is very long) but I suspect there will be other readers who will disagree and claim this is what makes the Hedströms so likable and believable, because you get to know them quite well and see what makes them tick on the home front. Either way, this is an intriguing crime story, with plenty of atmosphere — you get a real feel for the hot Swedish summer and the idyllic tourist-driven community in which it is set — and enough riddles to keep you guessing until the very end. 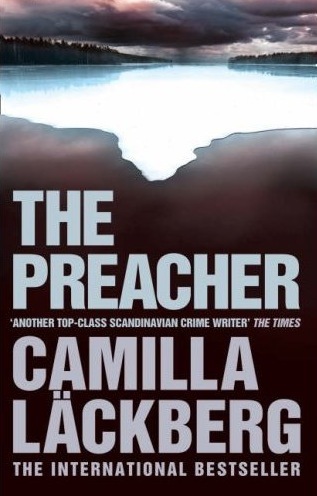 According to Läckberg’s own website, some 80,000 copies of the The Preacher have been sold in “pocket version” in Sweden alone. I rather suspect when this English translation becomes available in paperback those figures will skyrocket — and, quite deservedly so, I might add. Last year I read Echoes from the Dead by Johan Theorin and got hooked on Scandinavian crime fiction. However, when I tried The Ice Princess by Camilla Läckberg, I could not get on with it at all – there was just something about her style that I did not like. I haven’t heard of Johan Theorin, so that’s another one for me to look up! Help! Do I really need to add another book to my always-expanding queue?! I have to be honest and say that having just read “The Preacher” I wouldn’t be tempted to read Läckberg’s “The Ice Princess”. There was something about the style that grated, and the domestic stuff was a bit too cosy for my liking. I enjoyed it as a bit of light relief – no more, no less. I have The Ice Princess in my queue (I’m Swedish, so I feel I “have to” read my fellow Swedes), but I hope it’s better than this one seems to be. Thanks for the review – I can adjust my expectations!! Kimbofo, maybe you’ll like The Stonecutter (#3) better. I did. I will keep my eye out for it, Reg.